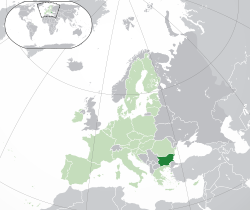 An Bulgarya (Република България) usa nga nasod ha Europa. An kapital hini amo an syudad han Sofia. ↑ 2011 census, p. 4. ↑ "Gini coefficient of equivalised disposable income (source: SILC)". Eurostat Data Explorer. Ginkuhà 13 August 2013. ↑ "Human Development Report 2014 – "Sustaining Human Progress: Reducing Vulnerabilities and Building Resilience"". HDRO (Human Development Report Office) United Nations Development Programme. Ginkuhà 25 July 2014. Ini nga pakli kataposan nga ginliwat dida han 12:34, 11 Agosto 2015.